In the 1970s during Houston’s oil boom, the city’s Gulfton neighborhood sprouted street after street of luxury apartment complexes catering to the single young professionals pouring in to work in the oil industry. Swimming pools, hot tubs, and even a disco seemed essential in the complexes, while neighborhood developers simply skipped building sidewalks, parks or other public amenities. When the bottom dropped out of oil a decade later and the oil professionals left, rents in these complexes plummeted too. In the 1970s during Houston’s oil boom, the city’s Gulfton neighborhood sprouted street after street of luxury apartment complexes catering to the single young professionals pouring in to work in the oil industry. Swimming pools, hot tubs, and even a disco seemed essential in the complexes, while neighborhood developers simply skipped building sidewalks, parks or other public amenities. When the bottom dropped out of oil a decade later and the oil professionals left, rents in these complexes plummeted too. The neighborhood mutated from a playground for singles into the landing place for low-income immigrant families looking to make their homes in the U.S. In 20 years, the neighborhood population doubled. By 2000, Gulfton had become, and still is, the most densely populated and most culturally diverse neighborhood in Houston. Unfortunately, crime and poverty in the neighborhood had increased to such a degree that the area was often now called the “Gulfton Ghetto.” Today it has roughly 16,000 people per square mile, a total of 50,000 residents representing over 40 nationalities. Neighborhood Centers Inc. (NCI) had been working in the neighborhood for years, running an early childhood education program, a youth program, and a family literacy program. In the process, it had learned about “the strengths and the resources of the people that resided there,” says Ann Hilbig, NCI’s Vice President of Program Planning and Evaluation. “The rest of the city was looking at that neighborhood and saying, ‘Whoa, that’s a problem neighborhood,’” but NCI saw beyond the Ghetto reputation. One of the largest non-profit organizations in Texas and over 100 years old, NCI focuses on strengthening underserved neighborhoods to create vibrant, healthy communities where families can be successful. In a 2014 interview, CEO Angela Blanchard said, “To create the vibrant places that most of us seek, where you can be a child, adult, and an older person, it requires that we pull in multiple elements.” Our current siloed funding streams and policies, she notes, are not well designed to support the holistic, multi-faceted community development that families need in order to thrive. NCI works with residents, business leaders, elected officials and organizations serving the neighborhood. It seeks funding and other resources. And it coordinates a complex collaborative process that melds these elements together into a transformative whole. In some neighborhoods, this takes concrete form in the building of a physical community center that provides vital services and anchors community life. NCI has built six such centers now, most in Houston. It also manages more than 70 other service sites across 60 Texas counties. Its existing programs in the Gulfton neighborhood meant that NCI had regular daily contact with Gulfton residents. Says Hilbig, “we were able to work with whole families and we were learning a lot about what was going on there.” Parents met each other through these programs and began talking about the neighborhood and what they felt it needed. As these families learned about the neighborhood centers that NCI had built elsewhere, they began to ask for a center in Gulfton. The grassroots Gulfton Area Neighborhood Organization, founded in 1992, had been advocating for more services for the neighborhood for years and also began asking NCI to build a center, as did local elected officials familiar with NCI’s Ripley House in Houston’s East End. 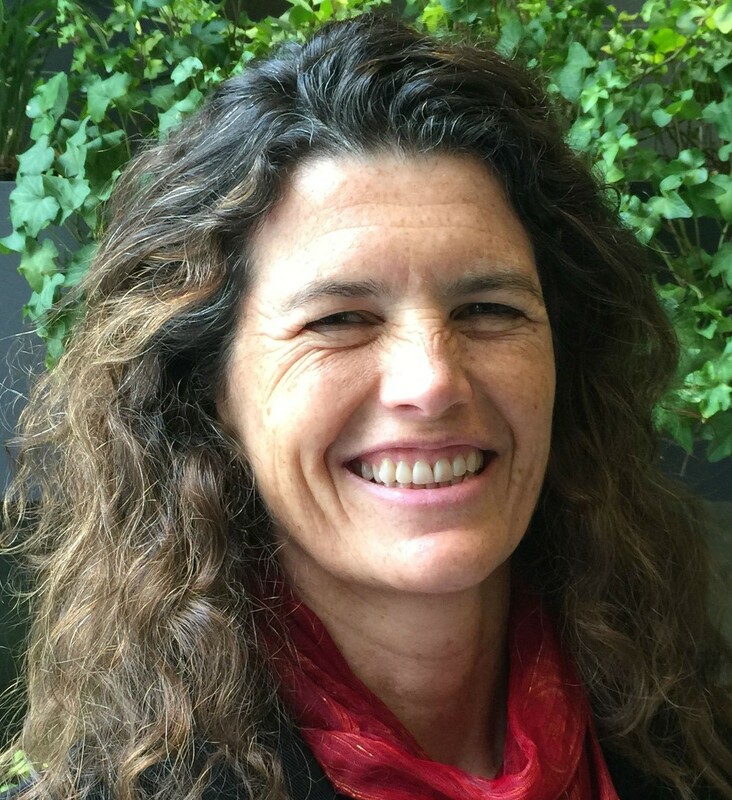 Between 2005 and 2006, a number of things fell into place, including “growing interest from potential donors,…growing public will from the community,” and the availability of a suitable four-acre piece of land, explains Hilbig. With seed money from donors, NCI decided the time was right to build a center in Gulfton. Themes emerged. Gulfton is a community that takes pride in its ethnic diversity. Its residents are industrious, exuding a powerful work ethic and strong family values. With these as starting points, NCI involved the community in every step of the design process for the new center, bringing on community-centered planning and design firm Concordia LLC, and working with place-making experts from the Project for Public Spaces. Residents weighed in on everything from the services that should be provided to how the buildings should be arranged, even choosing the paint colors. This engagement coupled with the Appreciative Inquiry process, NCI believes, helped create a deep sense of ownership within the community. For example, residents who have graduated from trainings and classes then volunteer to teach others. Youth get involved in planning celebratory events at the center. New entrepreneurs who got a leg up on their businesses with help from the Baker-Ripley business center hire their neighbors as their businesses grow and volunteer to help others launch their own new endeavors. And despite the open campus, the center has never been vandalized. Residents also take the initiative to bring in services and activities they’d like to see, such as when Pakistani residents wanted to ensure that their children retained their native Urdu language. They requested the classes, identified an instructor who could teach them, and NCI made the classes happen. And at the annual Taste of Baker-Ripley Parade, the community celebrates all of its diverse cultures and countries, with music and national garments, flags and regional foods. NCI pursues a strong media and communications strategy that reframes the neighborhood story to focus on strengths, assets, and aspirations, retelling the story for both residents and the greater community alike. Since its opening in 2010, the Baker-Ripley Center has brought a new vibrancy to the Gulfton neighborhood, providing an anchor point and a catalyst for a wide array of positive changes for the diverse community living here. Partnership with community residents and other neighborhood stakeholders lies at the heart of NCI’s work, and Blanchard emphasizes, “we [only] go where we’re invited.” Once invited, NCI plays a strong, central coordinating role in the development and ongoing management of a neighborhood center, bringing together the financing for the project, initiating the community planning process, and coordinating the involvement of additional partners. NCI thus serves as what has come to be called, in the community development field, a “community quarterback.” In Gulfton, NCI’s resident-centered approach included testing the Appreciate Inquiry model. NCI selected Concordia LLC and the Project for Public Spaces to lead the design process in order to ensure deep community engagement throughout the that phase, as well. By aligning their planning, NCI and the city were able to create a block-long pedestrian mall and plaza, closed to car traffic, that connects the Baker-Ripley Center with the city’s new multi-service center. Throughout the project NCI stayed in close conversation with the City of Houston, designing the Baker-Ripley Center campus to link seamlessly with Houston’s Southwest Multi-Service Center – a concurrent city project that offers programming geared to women, infants and children, offers an array of health and adult education and health programs, and has a library branch that provides residents with internet access. By aligning their planning, NCI and the city were able to create a block-long pedestrian mall and plaza, closed to car traffic, that connects the two campuses. Residents have easier access to the services at both centers and much-needed green space in this community with limited parks. The design also helped to slow traffic on a previously dangerous street near a middle school and several agencies and service offices. New Markets Tax Credits (NMTC) helped fund the $17 million development, as did substantial grants and donations from many local foundations and corporate donors. 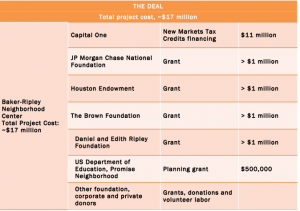 Capital One arranged NMTC financing of $11 million, while major donors that have contributed $1 million or more to the project include JP Morgan Chase National Foundation, the Houston Endowment, The Brown Foundation and the Daniel and Edith Ripley Foundation. Because government grants are quite specific in what they fund, NCI relies upon corporations, foundations, and individual donors for more flexible funding. Modest program fees for some classes and activities at the center bring in ongoing revenue, and the interest generated from NCI’s endowment and revenue generated from some of its service programs help, as well. This more flexible funding allows NCI to offer a broader range of economic, social, and health and wellness services and to work more holistically to support the multifaceted goals of the community. Finally, the center would not be what it is without the thousands of volunteer hours contributed by community members. The capital campaign for the project to raise money for construction as well as for the first few years of operating expenses involved a new approach for NCI. Rather than going out to funders and donors with a litany of neighborhood problems and needs, explains Hilbig, “we were saying, ‘This community has great potential for vibrancy, and we think your investment there will really pay off.’” NCI found that this asset-based and forward-looking framing for why funders and investors should support the project really worked, and it was able to raise the capital it needed. 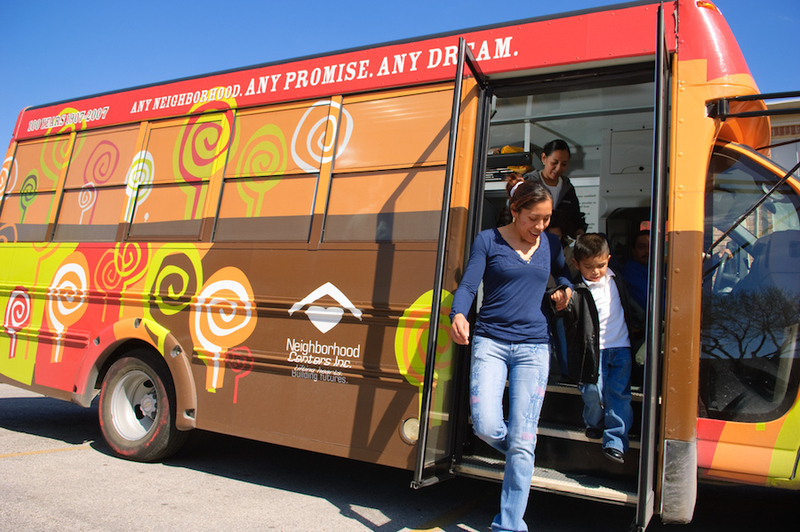 Initial work in the neighborhood, through early childhood education, youth programs, and adult literacy classes gave NCI insights into neighborhood assets and strengths, and built relationships with neighborhood families. Neighborhood residents and leaders asked for a neighborhood center in Gulfton. The Appreciative Inquiry approach highlighted neighborhood strengths and assets, and gave both residents and NCI a new story to tell about the neighborhood to funders, agencies, other partners, and to the larger Houston area. NCI had never used this approach before and was not sure how it would be received, but it turned out to be very effective. Seed money to purchase the property became available at about the same time as an appropriate piece of real estate went on the market, and at a time that NCI felt sufficiently strong interest and commitment to the idea from the community. 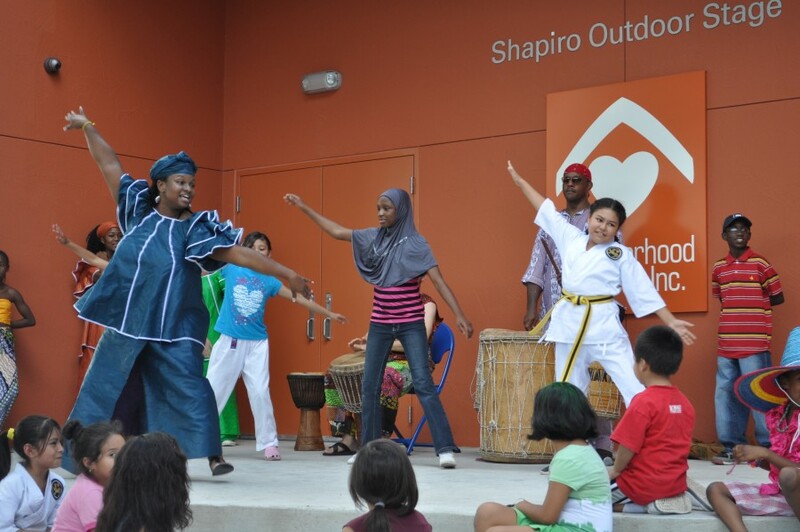 The neighborhood has experienced significant positive change since the center opened in 2011. School test scores are up. Tax filing services have helped residents receive a whopping $36.5 million in tax refunds to which they were entitled. Residents engaging with NCI reported feeling more connected to Gulfton and their neighbors. Between 2011 and 2014, more than 76,000 people were served through the Baker-Ripley Center and as a result, many have become citizens, earned their GEDs, learned English, registered to vote, found jobs, and much more. The center now has 8,000 visits per month. With business training and financial services available at the center, community residents have been launching small businesses, such as manufacturing piñatas now for sale in area grocery stores and flea markets, and operating market stands selling a variety of goods at the center complex. Crime is down 16%, and high school graduation rates are improving. NCI attributes these factors to the more connected, supportive, engaged community. But, Hilbig says, they haven’t yet figured out how to connect those dots with data. Evaluation methods, which are continuously improving, demonstrate the value of specific programs and initiatives at the Baker-Ripley Center, and NCI believes that providing numerous community-building services can positively influence economic conditions, education and skill building, and social cohesion within the community. However, it can be a challenge to measure the impact of these services on complex community indicators, such as reduced crime or increased income – both of which have occurred in Gulfton. Hilbig explains, “There are things we can say about what our specific programs have done [e.g. the tax refunds secured], and there are community indicators we can point to that we believe we have played a major role in, but we can’t yet draw that direct line.” Hilbig’s department at NCI is overseeing a process of developing better ways to measure and track outcomes, to better understand the impact of the holistic and multifaceted approach to community development that NCI is modeling.